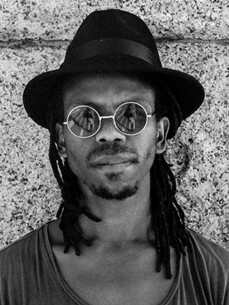 Floyd Lavine is an artist of a new african generation. Born and raised in South Africa, Floyd explores our global village in every direction with one foot in Berlin and the other in Cape Town. Gaye, Green, Wonder, Fassie; past legacies were a crucial influence in Floyd’s early life before his introduction to house and techno through the likes of MAW, Kerri Chandler and Dennis Ferrer.! Seeking some uncharted adventures, Floyd was drawn to London to explore music and develop himself as an artist. Whilst studying music production and business, he started! a label called Uberbeat Records with his friend and fellow DJ/producer Quintin Christian. Together, they worked under the alias Live Tech Rebelz – a production duo with numerous EP releases. ! Floyd has had the pleasure of showcasing his unique talent at some of Europe’s premier! events, venues and festivals including the Panorama Bar – Berlin, Glastonbury Festival, Get Loaded In The Park, WaterGate – Berlin, KaterHolzig – Berlin, Wanderlust – Paris, Nuba! – Paris, Unit 7 – London, Zombie Ate My Brain, The End/AKA, Platinum, Excuse! the Mess, Créche and Jaded. ! Floyd has released his music on some of the leading international underground labels including Upon.you Records – Berlin , Murmur Records – London , Dogmatik – London, Lower East – London and now on his co-owned imprint, Nomadiq Music. His tracks have been supported and remixed by the likes of Maya Jane Coles, Dubfire, Pezzner, Jef K, Art Department, Tini,Tom De Mac, Loco Dice and Anonym. !